Today marks the end of my post rotation articles. With formats such as Legacy, Modern, and EDH gaining more popularity all of the time, reviewing cards that are rotating out of standard has become just as important as looking at an expansion before a pre-release. Metagames change, new combos and synergies are found, and sometimes by looking at a card a second time, we can see something that wasn’t there before. The Return to Ravnica block was a multicolor heavy block, and it contained some of the best ones in recent memory. Some were great in standard such as Blood Baron of Vizkopa, but not all of them will continue to shine come October. Due to the large number of multicolor cards, I’ll be focusing on the top 20 cards rotating. You might not think it, but there are that many that have made an impact on standard and without them the metagame will change. We start off the list with Abrupt Decay. It’s been a heavy hitter ever since it was released. An uncounterable removal spell that hits any permanent with a cost of 3 or less has been big in Legacy since day 1, and Modern followed soon afterwards. Black and Green decks weren’t huge during Innistrad block outside of GBW reanimator decks, but the card started to really pick up during Theros block as it was adopted by Black/green devotion and pretty much any other deck running that color combination. It’s also an important part of every BG/x deck in Modern as well. It was at about $8 during Innistrad’s rotation, but now it is sitting closer to $12 with RTR set to rotate soon. There is a lot of demand for this card, and there will continue to be in the coming years. 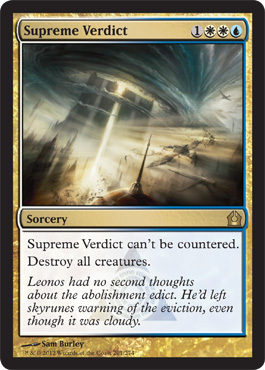 It’s a powerful card, and the “cannot be countered” cycle of cards are likely not to be reprinted for a long time. This means this card has nowhere left to go but up. Even at about $10 I think this is still a steal and would pick up as many as I could at that price. Most places in Japan are already buying it for 1300 yen ($13) or more, and are selling it for over $20 already. Hurry and get them for $12 if you can. I guarantee it will be a good investment. There was a time during standard where you could counter your opponent’s boardwipes and all was well (I’m looking at you Day of Judgment). Then Supreme Verdict was printed and all non-control players collectively moaned. This was a card of inevitability. Nothing filled me more with dread than seeing an opponent get this off a Jace, Architect of Thought -2 then wipe my board the following turn. It really hurt ramp strategies and aggro during Theros block, and forced opponents to be a lot more cautious. End Hostilities gives non-control players some breathing room thanks to its 5 mana casting cost and the ability to be countered, and personally I think that’s all they need to thrive. Give me another turn to drop my planeswalker or to get a few more points of damage in, please. This card, like Abrupt Decay, probably won’t be reprinted for a long time because it’s part of the “can’t be countered” cycle. It’s going for about $3 right now, and that seems about right. It could definitely see some play in modern control decks after rotation, as well as some EDH ones. I don’t see it being as common place as Lightning Bolt, but there are a decent number of control players that might have some in their decks or sideboards to keep the price afloat. You’re probably fine trading yours away at the current value, or holding onto it. I wouldn’t be surprised to see it gain back some value to around $5-6 after a year or two. 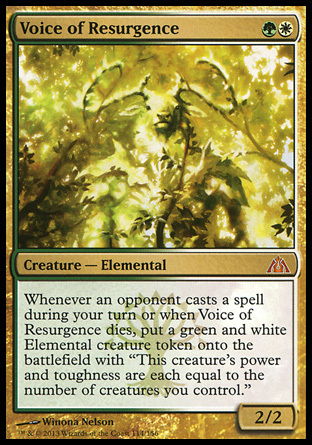 Voice of Resurgence was a pretty sweet card when it first came out. It was amazing against Esper control during RTR/ISD block, and it was also a key card in GW aggro during the twilight of Theros block. It was the best card in Dragon’s Maze, and was selling for around $40 for a very long time. Lifebane Zombie and mono black shut down GW for a few months and in response the card started a slow tumble to it’s current price of about $20. GW aggro will be losing not only this but also Loxodon Smiter. It’s losing its muscle, but it should still be viable after rotation. I foresee Voice of Resurgence having a great time in retirement come October. It sees play in Modern in Hatebears and Birthing Pod, but also should see some play in EDH. Birthing Pod is a very good Modern deck that isn’t going anywhere, so it might not be a bad idea to hold onto the card. I think it will be good trade material, but I wouldn’t blame you for trading/selling it now while you can still get good money for it. Burning-Tree Emissary has a storied history. During the last block, it was part of the Gruul Aggro deck with Flinthoof Boar and Hellrider that showed us how dangerous putting creatures into the battlefield for free could be. When Theros arrived with Nykthos, Shrine to Nyx, BTE was repurposed with a new role: pushing out huge creatures very quickly. It did this role very well, and various devotion decks dominated the metagame. First it was Colossal Gruul, then Mono red devotion (with white or black), and most recently it’s fought alongside Genesis Hydra in green devotion decks. By adding devotion to help with Nykthos, as well as giving you 2 free mana to do whatever you want with it, it revolutionized how we play. This card doesn’t really have a life outside of standard yet, but be patient. I think she’ll see play in some Tier 2 aggro or Devotion decks in modern in the coming months, especially with Wooded Foothills being reprinted in Khans. She’s at her lowest now (about $1.50), so it would be my recommendation to buy your playset right after rotation. She could be very fun to brew with, and I expect demand for her to go up the further we are away from RTR block. I’m also not sure if we’ll see her reprinted (though being reprinted in Khans would be awesome. She definitely fits with Temur!). 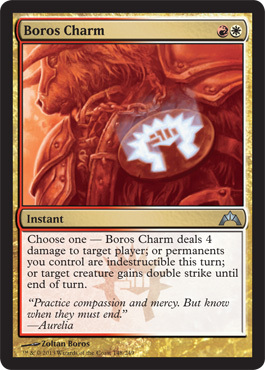 Boros Charm is just plain awesome. Each and every mode of the card has seen heavy play and in my opinion it came out as the best Charm in the block. It’s first mode saw a lot of play in RW burn. Being able to do 4 damage to an opponent for 2 mana was pretty big, and what made it better was Satyr Firedancer later on (effectively turning it into a burn spell for creatures too). The 2nd mode was used effectively in RW aggro decks against control or other decks that sought to wipe out your board, and the third option allowed you to push through crazy amounts of damage with your creature. This was especially true in Naya hexproof decks after you suited up your creature. The loss of it in standard will affect each of those decks, but I think it’s possible to find an alternative since this wasn’t a role player in any of those decks. It’s $2.50 right now, and that’s probably as low as you’re going to see it. Modern burn plays 4 of them, and that deck just won GP Kobe so I’d expect it to hold a lot of its value if not go up after rotation. It’s also very popular in EDH, so investing in an $8 foil might not be a bad investment either. These charms will possibly get reprinted in future Duel Decks or other supplements, but I don’t think they will be in standard ever again. I mean, how many times did Emerald Charm get reprinted? Plus the Boros name means it’s attached to the Ravnica world. This could easily be a $5 card by next year. Another huge blow for UW control players. Its retirement means that Banishing Light will assume the role of exiling permanents from play. Of course the draw back is that it can only target ONE thing. This will also hurt Mono blue that splashes white, pretty much taking away any reason to play the splash. 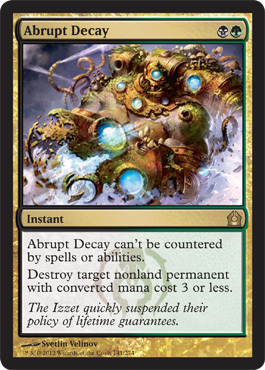 It was a great card during standard, but it will be hard pressed to find a home in eternal formats where Abrupt Decay is absolutely everywhere. Not saying it won’t see play, just that it won’t see a lot. 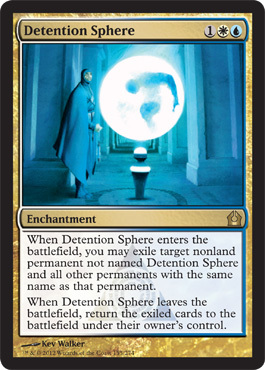 I’ve seen players using it in Ghostly Prison/Sphere of Safety decks, but that definitely isn’t tier 1. There will be some demand for it, but not enough to keep it above $1. I’d trade these away now if you still can. We could see it in a future set, but I wouldn’t expect it for a few more years. 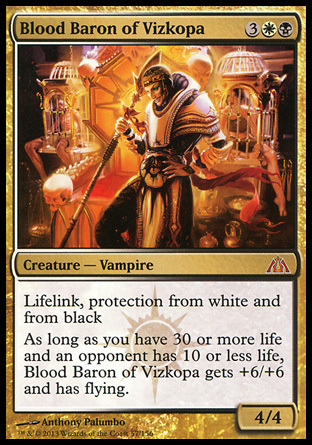 Blood Baron of Vizkopa was such a cool card. I remember buying my playset at $8 each before they went to $20+ during Theros block. They were amazing in both GBW and BW Midrange decks and were the bane of mono black devotion strategies. It got around all of their removal as long as it wasn’t eaten by a Lifebane Zombie or Thoughtseize. They held a lot of their value until the very end, and have only recently hit about $4. It has 2 things going for it after rotation: it’s Vampire typing and colors. I think it’s a strong contender for EDH in an Orzhov deck (alongside Exquisite Blood and Sanguine Bond), so look for foils at around $10-12 and pick them up. The regular ones might drop in value a little more, but I think $3-4 sounds about right for the immediate future. I’m pretty sure Vizkopa is a Ravnica word, so he probably won’t be reprinted for a long time either. I expect long term growth. Domri Rade has really grown on me these last few months. He originally showed up in Naya/GR aggro decks and later became a key card in Jund/GR monsters. Most recently I’ve had him in my GR Genesis Hydra deck. His ability to give aggro decks great card advantage while also acting as a form of removal kept his price above $30 for most of his time in standard. As his time in standard comes to a close, he still hasn’t found a place in modern or other eternal formats. This is probably the reason why he has dropped to $10 so close to rotation. Aggro decks might be dead in Legacy, but they still have a chance in modern. With Wooded Foothills being reprinted I think we could see a lot more green or red based aggro decks in modern instead of just Zoo. I think there is a good chance that he can see play again, so I would recommend getting a playset at $10 each. 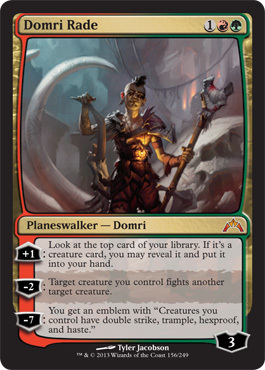 Domri is also the youngest planeswalker ever, which means we haven’t seen the last of him yet. It would be great to see him return in a future set, but there’s a 50/50 chance that it could be a new form. 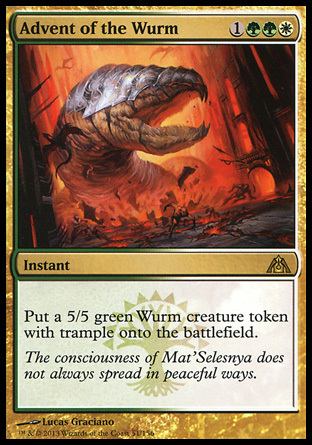 After Restoration Angel rotated, Advent of the Wurm took up the mantle of scary 4 drop. Whenever a GW player left 4 mana open, you KNEW there was something up their sleeve. It saw a lot of play at the end of the Innistrad block, but after that it had a hard time finding a place in standard. Some GW decks used it, and some skipped it altogether to keep their mana curves low. It’s not a card that I can see having any type of impact on eternal formats, but I think foils might find their way into some EDH decks in the future. A foil can be bought for around $3-4 online now, so if you feel like investing in one, be my guest. This is more of a gamble though. I DO think we could see this return in a future set sooner than the other Ravnica cards though. The name and ability can easily find their way into another set in a few years. Gimme a Break . . . I think this is a good spot to take a break. I’d really like to get this all done in one article, but it’s looking like this one will become about the size of Homer’s epic the Illiad if I continue. Therefore I’ll be taking a short break and posting the next article in another day or two. What do you think of the list so far? Think something is missing? Well, don’t say anything just yet. There were a lot of solid Multicolor cards in the Return to Ravnica block and a top 10 simply won’t do it justice. 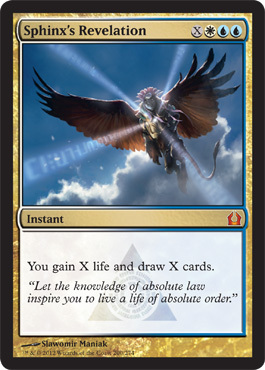 To recap what I covered today, the loss of the Azorius Trifecta (Detention Sphere, Sphinx’s Revelation, Supreme Verdict) will severely cripple control decks, and in response we are going to see the archetype go back to its counter spell/kill spell roots I believe. This gives both Red and Black the advantage, but I think white will also be a good control color thanks to Banishing Light, End Hostilities, and Utter End. The loss of Abrupt Decay will hurt BG decks, but I think they’ll manage and find other removal spells such as Hero’s Downfall, but the loss of Boros Charm will make playing Burn decks very difficult. They’ve lost over 40% of their deck, so I don’t think we’ll see it for a while. There are also a lot less devotion makers going into Khans of Tarkir standard (including Burning-Tree Emissary) so I don’t see devotion decks continuing either. Nykthos, Shrine to Nyx will see a lot less play, and most of those decks will probably switch over to ramp strategies with mana creatures. GW aggro decks should also lose some oomph, but I think they’ll recover and be assimilated into Abzan (GBW) decks pretty easily. That’s it for now, so I hope to see you back here next time! Until then, enjoy the Khans of Tarkir spoiler and good luck preparing for next weekend!